Approx 150kDa band observed in Human Kidney and Pig Lung lysates (calculated MW of 153kDa according to NP_001007268.1). Recommended concentration: 1-3µg/ml. Specificity This antibody is expected to recognize all reported isoforms (NP_031392.3, NP_001007268.1, NP_001182570.1). Immunogen Peptide with sequence C-EKKKDTPKQHGT, from the Internal region of the protein sequence according to NP_031392.3, NP_001007268.1, NP_001182570.1. 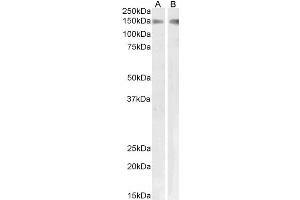 Peptide ELISA Statement: Peptide ELISA: antibody detection limit dilution 1:1000.